The process of cleaning up after a construction or a remodeling project can be quite a challenge for most people. You need to make sure that you can take the time to evaluate if you can get this done by yourself or if you need to hire professional help. The removal of dust and debris is going to take time and you need to be meticulous about it if you want to see the best results. 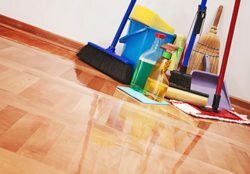 The best way to do this is to use eco-friendly cleaning products and methods that will keep everything clean, but they will also avoid harming the environment. This is the reason why hiring professional services is the best way to wrap up the process of construction and remodeling. The world deserves our protection and we deserve a clean environment. Being aware of this and applying eco-friendly cleaning to any location is our responsibility.